Download Logos & Awareness Ribbons Order Brochures and Materials For The Press Know The Lingo Have A Question? Get the Lifeline logo, order Lifeline brochures, and find recommendations to help raise awareness online or cover issues of suicide in the news. Our logos are available in English and Spanish. You don't need permission to use them, but please do not alter the logo in any way. We appreciate a link back to the Lifeline where possible. 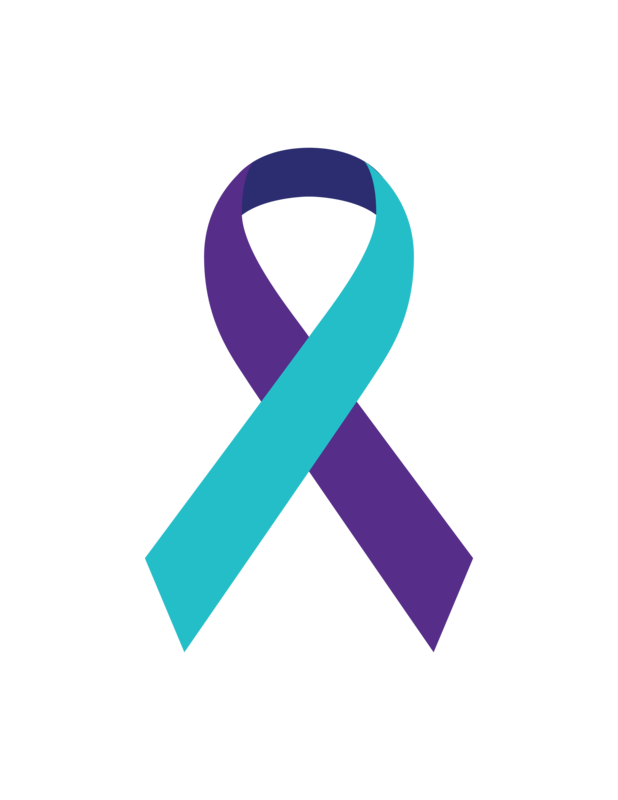 The purple and turquoise ribbon symbolizes suicide awareness and prevention. Use it as your social media profile picture to show your support. You can download PDFs of Lifeline wallet cards here. Visit the SAMHSA store to order print brochures, wallet cards, and more. All print orders must be placed via the SAMHSA store. The Lifeline does not take brochure orders or ship print materials directly. Covering suicide is never easy, but it's very important to do it right. Research has shown that improper reporting on suicide can contribute to additional suicides and suicide attempts. Always include a referral phone number and information about local crisis intervention services. In online coverage, include links to prevention resources to help inform readers and reduce risk of contagion. The National Suicide Prevention Lifeline toll-free number, 1-800-273-TALK(8255) connects the caller to a certified crisis center near where the call is placed. Don’t include photos of grieving family, friends, memorials, or funerals. Don’t quote the suicide note or describe the method used. Avoid quoting police or other first responders about causes of suicide. Instead, seek advice from suicide prevention experts, like the Lifeline. Develop policies and procedures for safe commenting and monitor for hurtful messages or comments from posters who may be in crisis. Consider posting the Lifeline information in the first comment box in any story about suicide. To learn more, visit reportingonsuicide.org. This free toolkit provides recommendations for supporting suicidal individuals on social media and digital communities. Please contact Frances Gonzalez at [email protected] for all press inquiries or partnership inquiries regarding the National Suicide Prevention Lifeline. Understand mental health and suicide prevention terms and phrases.